Dr Carr qualified in 1991 from Sheffield University Medical School and trained in cellular pathology in Birmingham and the South East Thames Regional Rotation culminating in 4 years as a Clinical Lecturer at St Thomas' Hospital, London. Dr Carr previously participated in an international study funded by the National Institutes of Health in to the pathology of cerebral malaria. Dr Carr developed his interest in Dermatopathology training with world renowned experts Dr Phillip H. McKee and Dr Eduardo Calonje at St Thomas' hospital and the St John's Institute of Dermatology. Dr Carr has the Royal College of Pathologists (RCPath) Diploma in Dermatopathology (set at expert referral level) and becaame an examiner for the diploma in 2005. 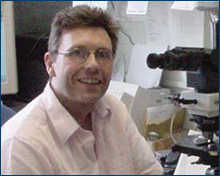 Dr Carr receives cases for expert opinions from other histopathologists throughout the UK. Dr Carr is also our lead pathologist for Ear, Nose and Throat pathology and has an interest in pathology of the urinary tract. Dr Carr has nearly 50 published papers and lectures regionally, nationally and internationally in dermatopathology. Dr Carr also has active research interests in dermatopathology and laboratory organisation in cellular pathology including participation in the RCPath working group looking at workload and job planning in cellular pathology. Dr Carr has previously been organiser of the West Midlands Region external quality assurance (EQA) scheme and has recently been co-opted to the Steering committee of the National Skin EQA scheme. Dr Carr organises a slide of club of leading experts in the field of melanocytic pathology, is commited to post-graduate teaching and receives regular local, national and international visitors to share his extensive slide collection.